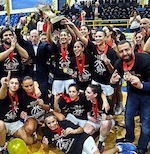 Al Riyadi Club are the WLBL Champions 2019! Homenetmen Antelias are 2019 Lebanese Cup Champions! Kristina King - The King of Queens is back! SG Bergishe Loewen (Germany) strengthened their roster for the summer with the addition of 32-year old Lebanese guard Aida Bakhos (178-86, college: Lamar). She started the season at Al Riyadi in Lebanese WLBL. She helped them to win the League title despite they ended the regular season at the second place. They also played in the Supercup final. This season in Lebanese league where in 14 games she recorded 13.3ppg, 6.1rpg and 3.9apg. This will be her second stint in the Liga Mediterranean Cup (playing under coach J.D. Barnes). Last summer she helped the Lebanese squad win its first international cup in France. 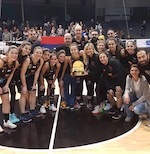 Among other achievements she received Eurobasket.com Mediterranean Cup All-Defensive Team award in 2018. "Aida was an easy choice for me this summer", said Barnes. France is a great country for basketball. In order to compete against so many good international clubs we need players and personalities like Aida. I feel her style of play will fit well with our Germans and imports. Bakhos also represented Lebanon at the FIBA Asia Cup Division B in India two years ago. Her team won Bronze and her stats at that event were 6 games: 6.7ppg, 4.7rpg, 1.3apg, FGP: 29.3%, 3PT: 25.0%, FT: 65.0%. "The bottom line is Aida is a winner", said Barnes. I want to continue to have this type of player around our young Germans. In order to be a winner you have to continue to be around winners. Bakhos has won over 10 League and Cup championships over her career (Lebanese Cup 4x, Lebanese League Champions 4x, WABA Cup Winner, Mediterranean Cup Winner). She attended Lamar University until 2008 and it is her eleventh (!!!) season in pro basketball. Al Riyadi Club are the WLBL Champions 2019 as they won the Final series against Homentmen 3-1. Trailing 0-1 after the opening game, Al Riyadi Club posted three consecutive wins to lift up the trophy. Riyadi just defeated Homenetmen Antelias 56-55 in game 3. Tonight they posted the decisive 60-54 victory. Schaquilla Nunn (190-F/C-94, college: Tennessee) erupted with 27 points and 25 rebounds to be named MVP of the game. Rebecca Akl (169-G-92) replied with 18 points and Chirine El Charif (185-C-84) as well as Meghrie Torissian had 12 apiece. Al Riyadi tied the Final series as they edged Homenetmen Antelias 62-57 in game 2. Schaquilla Nunn (190-F/C-94, college: Tennessee) top-scored for the winners with 18 points and Nathalie Sevadjian (170-G-88) notched 13. Lama Mokaddem delivered 9, whilst Daniella Fayad (F) poured in 8. Rebecca Akl (169-G-92) ended up with 16 points in the losing effort. Chirine El Charif delivered 15 and Leila Fares as well as Miramar El Mokdad had 10 apiece.